This weekend is very special. Because Friday is holiday and very big movie is releasing in this weekend. One is Ulaganayagan Kamalhasan's Uthama Villian and Aishwarya Dhanush directed action thriller Vai Raja Vai on this Friday. Want to know the reviews of these movies. here the Vai Raja Vai Movie review for you people who love Cinema. Vai Raja Vai is Gautam Karthik starrer thriller movie, The movie is directed by Superstar's daughter and National award winning actor Dhanush, Aishwarya Dhanush. This is second movie from her. Previously, 3 the movie acted by her husband and Kamal's daughter Shruthi Hassan. Vai Raja Vai is a gambling based thriller movie on the first. Tapsee Pannu played a negative role in this movie with Daniel Balaji. Vivek played a vital role in this movie. It should be suspense, because he will surprise you in the theatres. Vai Raja Vai - Is Casino Royale in Tamil ? 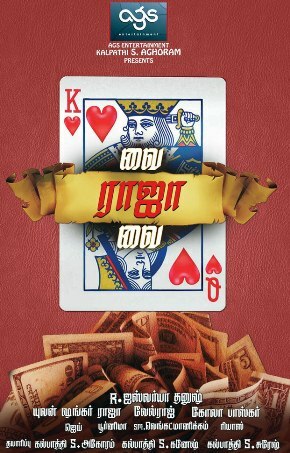 Vai Raja Vai, a world wide gambling thrill in tamil. It is acknowledged as good by Censor board members while the censor time. A very good tale performed by Gautam and priya anand in the leading pair. A close screenplay cuts and twists turns a normal boy to a gambler. A boy with good fortune helps some big gamblers as bidding person respective to them. He faces many problems because of the illegal help. Gautam brilliance is exposed here. Kudos to Aishwarya Dhanush. Tapsee become a Lady Villian in this movie. Yuvan Shankar Raja's fantastic music helps this movie very well. Songs released four months back. Vai Raja Vai is a good movie facing a big task against the biggie Uthama Villian. The team believe on this movie. So they decided to fight against with Kamal Hassan as her father did in the past years. Velraj is the cinematographer continues his work with Aishwarya Dhaush. He is favorite for this star family. Edited by VT Vijayan, another favorite one. For your surprise Dhanush did a Cameo role as Kokki Kumar which he played in the movie Puthu Pettai. Vai Raja Vai is a very good gambling thriller movie in the end.. Here it is our team revived the movie in first on net for you. 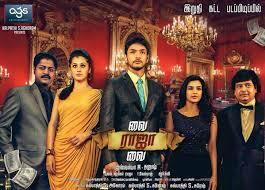 Vai Raja Vai movie review for you before heading to the theater. More movie , more review for you guys. As it is review, we cant reveal all the scenes and all. Here the brief idea about the movie. Want Uthama Villian review ? Here it is.